All The Little Lights transfers to Arcola Theatre in October 2017. Photo: Robert Day. Jane Upton’s 2015 play, revived this week at its original home ahead of a nationwide tour, is closely associated with Safe and Sound, a Derby-based charity combatting child sexual exploitation and supporting those affected. This relationship is foregrounded in programme and published script, and importantly so, because the play’s slow reveal of the traumas of its protagonists is no strategic ‘twist’ or mystery. In the sensitive hands of Laura Ford, Upton’s play negotiates the things that can and can’t be said, the experiences that shape and limit the very language available to victims. When the women at the heart of this play skirt around explicit statements of what they have endured and what they fear, they reveal their learned, intuitive strategies for survival. All the Little Lights spends a lot of time with characters who want to say anything other than what they really want to. When Joanne (Tessie Orange-Turner) throws an impromptu fifteenth birthday party (four days late) for her friend Lisa (Sarah Hoare), they don’t want to address why Lisa hasn’t been in touch with Joanne for some time; why Joanne doesn’t have Lisa’s phone number or had to post a missing person ad on Facebook to track her down. They don’t want to discuss the change in atmosphere that occurs when Joanne promises to take her twelve-year-old friend Amy (Esther-Grace Button) down to the chippy to meet ‘TJ’. And they certainly don’t want to address Joanne’s reasons for attempting to renew the friendship. Instead, as the three young women camp out near the railway line, they talk about anything else: the joy of spaghetti hoops, the plot of Frozen, a lengthy (and laugh-out-loud funny) recreation of ET saying goodbye to Elliott. They play games, from a version of chicken when they hear the trains approaching to imagining who lives in the ‘little lights’ that they can see blinking in the distance. Orange-Turner is terrifying and mesmerising as Joanne. Confident beyond her years, with a demeanour that turns on a knife-edge from fragile to violent, Joanne holds court between her adoring new sidekick and her estranged best friend. In a short play, Upton and Orange-Turner create a dizzyingly complex figure: victim and survivor, betrayed and betrayer, child and veteran. The nervous tension created as Joanne forces everyone to enjoy their spaghetti hoops and demands Amy explain the rules of childhood games is palpable, and when the tension erupts in moments of horrific bullying and a sequence in which she throttles, kisses and finally slaps Lisa hard, Orange-Turner reveals the character’s own terror. Joanne’s ambiguous nature and constant lying – is she luring Lisa back into captivity or genuinely reaching out to the only person who really understands her? – manage to make her a dangerous presence while never sacrificing sympathy. Lisa, the play reveals, escaped the bed and breakfast where she and other teenage girls were held, abused and filmed. Hoare’s performance is less showy than Orange-Turner’s, reflecting an important distinction between the bolshy attitude Joanne has cultivated to survive, and Lisa’s quieter conflicts between survivor’s guilt, fear of recapture and adjustment to ‘normal’ life with a foster family. One of the more harrowing moments is Lisa’s confession that she attempted to kiss her foster father, an instinctive reaction to a moment of awkwardness but, more importantly, an admission to herself that she doesn’t belong in her new world. The play wrestles with Joanne and Lisa’s pull towards each other’s worlds; neither can let go of what they have, nor can they fully accept their lot, but their bond is what has held them together thus far. Their facing down of the train (staged to terrifying effect on a raised platform, the rail shuddering and illuminating as the bright lights and deafening roar of the unseen train bear down on them before they dive out of the way) is the moment where they live as themselves, freed from the pressures put on them by the adults. Accompanying them is Amy. Button’s eerily childlike performance is frequently funny, whether in the uncontrollable hysterics at relighting candles or in the drawling repetitions of banal observations that leave Joanne rolling her eyes. Yet Amy’s simplicity leads to the production’s most affecting moments as Joanne mockingly tells her to send pictures of her breasts (‘I haven’t got any’) to TJ (‘smaller the better’) and Lisa falls silent. Amy’s adoration of Joanne brings out Joanne’s cruelty, and the evocation of a cyclical nature of a system of abuse that uses the older hands to pull in new recruits is, at times, unbearable. What carries the production is the authenticity of the bonds between the three actors. Whether bullying or laughing, beating or playing, these three young women have a shared existence and language that is their own, and that binds them together even through the ruptures of trust and love. 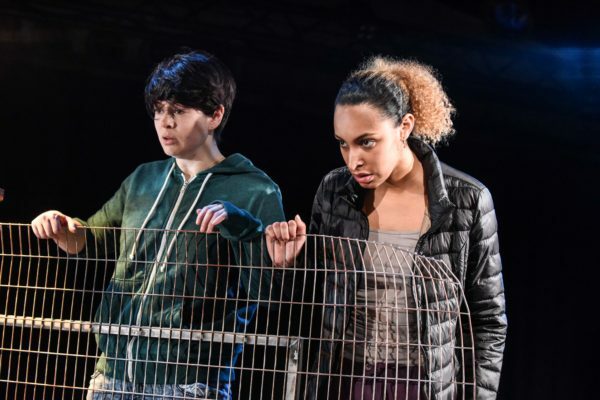 Joanne’s final act, holding her head high, permits of several interpretations, and marks an extraordinary achievement of writer, director and actors in cultivating empathy without sanitising or over-determining the characters. This is deeply affecting work on a too-urgent subject. All The Little Lights transfers to the Arcola Theatre from 10th October- 11th November. Book tickets here. Peter Kirwan is an editor, reviewer and academic, originally from the Wirral and now based at the University of Nottingham. He specialises in the contemporary performance of early modern drama and is the author of Shakespeare and the Idea of Apocrypha (Cambridge, 2015). He is currently writing a book on Cheek by Jowl, and writes The Bardathon review blog.